Published on March 31, 2015 in Creativity, Fun Stuff, Motivation, Personal Development, Positive Thinking and Vision and Planning. 0 Comments Tags: Atfer Graduation, Beyond Graduation, Goal Setting, Graduation, Personal Planning. 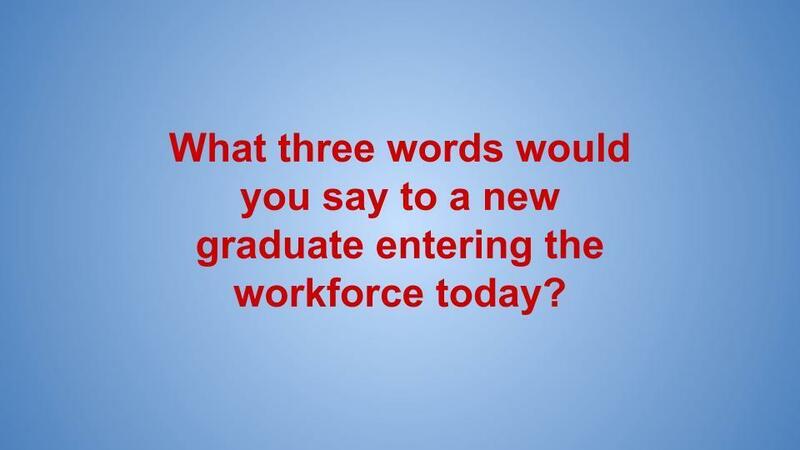 What 3 words would you say to a new graduate entering the workforce today? I like these challenges because brevity forces clarity of thought (and intent). Provide your contribution as a comment below. Published on March 3, 2015 in Motivation and Positive Thinking. 2 Comments Tags: Allegory, Classic Story, Life Lesson, Love Story. It is not often that a stranger’s story can affect you beyond words, but we discovered one person’s story that did just that – and I had to share it. I won’t reveal too much, other than ask that you read this story with an open heart and an open mind. Let me know what you think in the comments. When I got home that night as my wife served dinner, I held her hand and said, I’ve got something to tell you. She sat down and ate quietly. Again I observed the hurt in her eyes. Suddenly I didn’t know how to open my mouth. But I had to let her know what I was thinking. I want a divorce. I raised the topic calmly. She didn’t seem to be annoyed by my words, instead she asked me softly, why? I avoided her question. This made her angry. She threw away the chopsticks and shouted at me, you are not a man! That night, we didn’t talk to each other. She was weeping. I knew she wanted to find out what had happened to our marriage. But I could hardly give her a satisfactory answer; she had lost my heart to Jane. I didn’t love her anymore. I just pitied her! With a deep sense of guilt, I drafted a divorce agreement which stated that she could own our house, our car, and 30% stake of my company. She glanced at it and then tore it into pieces. The woman who had spent ten years of her life with me had become a stranger. I felt sorry for her wasted time, resources and energy but I could not take back what I had said for I loved Jane so dearly. Finally she cried loudly in front of me, which was what I had expected to see. To me her cry was actually a kind of release. The idea of divorce which had obsessed me for several weeks seemed to be firmer and clearer now. In the morning she presented her divorce conditions. She didn’t want anything from me, but needed a month’s notice before the divorce. She requested that in that one month, we both try to live as normal a life as possible. Her reason for this conditions were simple. Our son had his exams in a month’s time and she didn’t want to disrupt him with our broken marriage. This was agreeable to me. But she had something more, she asked me to recall how I had carried her into out bridal room on our wedding day. She requested that every day for the month’s duration I carry her out of our bedroom to the front door ever morning. I thought she was going crazy. Just to make our last days together bearable I accepted her odd request. I told Jane about my wife’s divorce conditions. She laughed loudly and thought it was absurd. No matter what tricks she applies, she has to face the divorce, she said scornfully. On the fourth day, when I lifted her up, I felt a sense of intimacy returning. This was the woman who had given ten years of her life to me. On the fifth and sixth day, I realized that our sense of intimacy was growing again. I didn’t tell Jane about this. It became easier to carry her as the month slipped by. Perhaps the everyday workout made me stronger. She was choosing what to wear one morning. She tried on quite a few dresses but could not find a suitable one. Then she sighed, all my dresses have grown bigger. I suddenly realized that she had grown so thin, that was the reason why I could carry her more easily. Suddenly it hit me. She had buried so much pain and bitterness in her heart. Subconsciously I reached out and touched her head. Our son came in at the moment and said, Dad, it’s time to carry mom out. To him, seeing his father carrying his mother out had become an essential part of his life. My wife gestured to our son to come closer and hugged him tightly. I turned my face away because I was afraid I might change my mind at this last-minute. I then held her in my arms, walking from the bedroom, through the sitting room, to the hallway. Her hand surrounded my neck softly and naturally. I held her body tightly, it was just like our wedding day. But her much lighter weight made me sad. On the last day, when I held her in my arms I could hardly move a step. Our son had gone to school. I held her tightly and said, I hadn’t noticed that our life lacked intimacy. I drove to office and jumped out of the car swiftly without locking the door. I was afraid any delay would make me change my mind. I walked upstairs. Jane opened the door and I said to her, Sorry, Jane, I do not want the divorce anymore. Jane seemed to suddenly wake up. She gave me a loud slap and then slammed the door and burst into tears. I walked downstairs and drove away. At the floral shop on the way, I ordered a bouquet of flowers for my wife. The sales girl asked me what to write on the card. I smiled and wrote, “I’ll carry you out every morning until death do us apart”. My wife had been fighting cancer for months and I was so busy with Jane to even notice. She knew that she would die soon and she wanted to save me from the whatever negative reaction from our son, in case we push through with the divorce. At least, in the eyes of our son— I’m a loving husband.